Sprites, textures, sounds, code, and other resources belong here. Share and share-alike! Is the resource ENTIRELY my own work? If no to the previous one, do I have permission from the original author? If no to the previous one, did I put a reasonable amount of work into the resource myself, such that the changes are noticeably different from the source that I could take credit for them? If you answered no to all three, maybe you should consider taking your stuff somewhere other than the Resources forum. Consult the Resource/Request Posting Guidelines for more information. Please don't put requests here! They have their own forum --> here. Thank you! 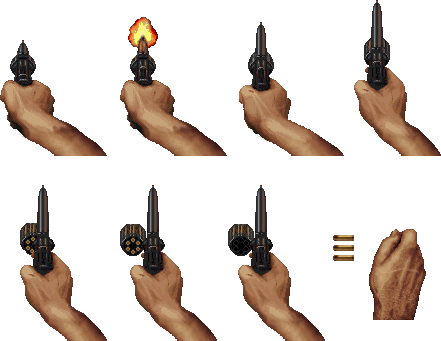 I am one of creators of Weapons Mod for Blood which can be found here http://www.moddb.com/mods/blood-weapons-mod. 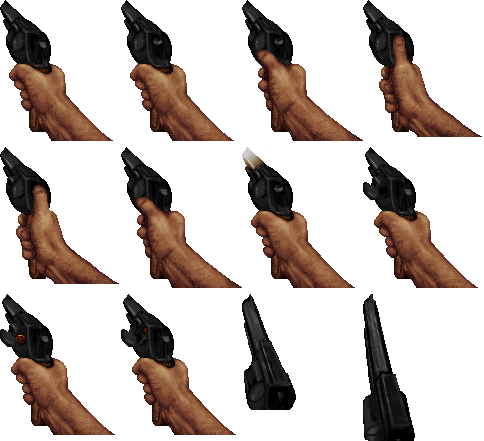 While working on my mod I made a lot of edits of weapon sprites, I decided to share all my resources. I hope I didn't miss anyone in credits, if I did, please let me know. And if anyone is interested in using my edits, please give me credit and people I mentioned in credits. You don't have to ask me for permission. 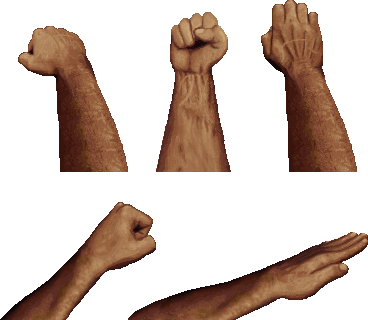 I collected various Caleb's hands and put them in my sheet, plus I added some own edits. I replaced original hands with Caleb's hands. Original hand was replaced with Caleb's one. I also made attacking frame more complete and made mirrored variant. Bottom part was greatly extended. 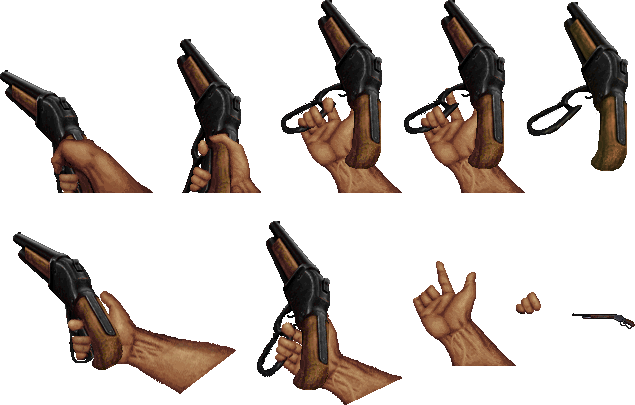 Original hands were replaced with Caleb ones. 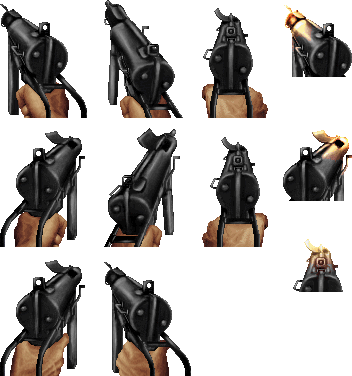 I made additional reload frames for Flare Gun. I combined a lot of sprites to have a full spritesheet of Ripper Heart for Blood. Additonal squishing is made by me either. Lightnings come from alpha/beta build of Shadow Warrior. 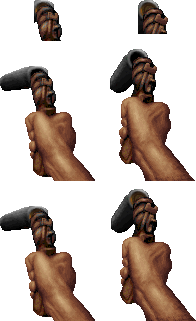 fgsfds made additional frames for being stabbed. 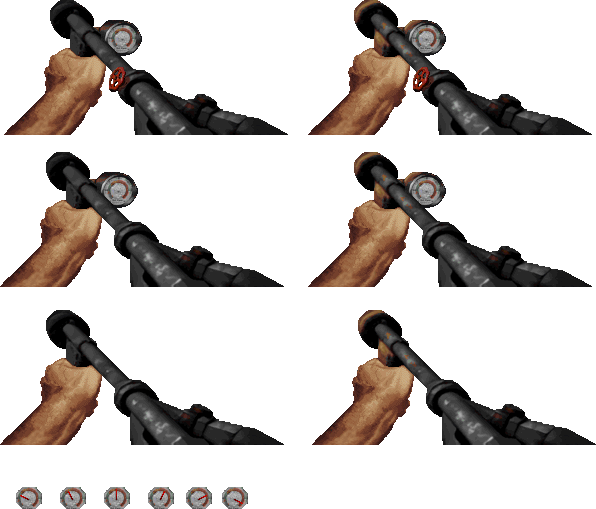 The original sprites were upscaled. The hand was changed and edited. Meter and valve come from another flamethrower which the author is unknown to me. Credits: Monolith Productions, Lobotomy Software, Treyarch. Bottom part was extended, magazine was extended. Mirrored other side (not finished). Bottom part was extended. Additional transition frames by me. Additional fire frame and hand without wire by me. 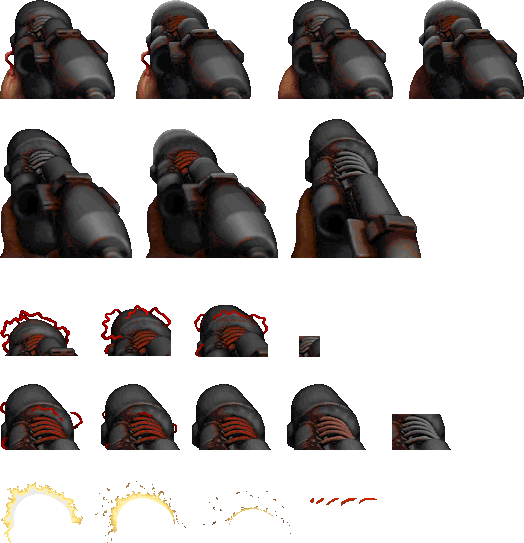 The full spritesheet is missing in Blood Alpha so I released the full one here. Bottom part was extended plus some minor changes to blurr effect. Life Leech without eye and with eye animation by me (used Blood Alpha eye sheet). I tried to make a nice cocking animation, but it looked actually bad. The main work is xenoxols', I only did a few edits for my purpose. I don't consider these edits finished, nor I am not planning finishing it. 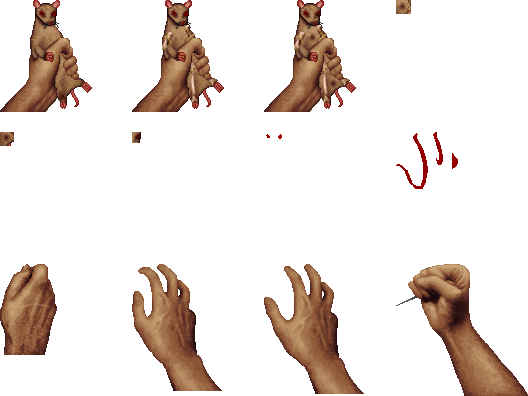 I extended sprites and changed hands. Kung Fu Master Caleb is here! Credits: Dzierzan, ravage, 3D Realms, Monolith Productions. Credits: Captain J, Valve (Day of Defeat game), Monolith Productions. Last edited by Dzierzan on Thu Jun 21, 2018 4:32 am, edited 11 times in total. I think that some of these resources look pretty good! That's just me though. 8/10 for the effort. Hi Dzierzan! I contacted you on your youtube channel about the heart from Shadow Warrior (and Blood needle) and really wanted for this day to come. I have a Blood project just waiting to go outside the door. I appreciate a lot your works. You are going to receive full credit for what is being used. Thank you for your amazing edits. Demons are a disease. Meet the cure. Ahh, it was you ^^. You're welcome! I am always eager to see more Blood related custom content. GAA1992 wrote: Hi Dzierzan! I contacted you on your youtube channel about the heart from Shadow Warrior (and Blood needle) and really wanted for this day to come. I have a Blood project just waiting to go outside the door. I am looking forward to it! Hopefully, the pump-action shotgun is included! 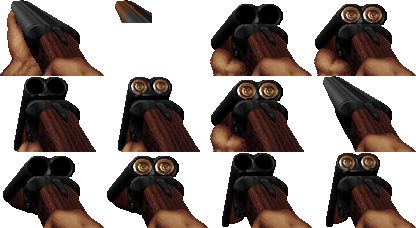 I love pump-action shotguns for their OOMPH. And, all of your mods are super-awesome, and I'm definitely looking forward to this Blood project you are working on! Location: Elfhelm... waiting for potatoes to get sane again. 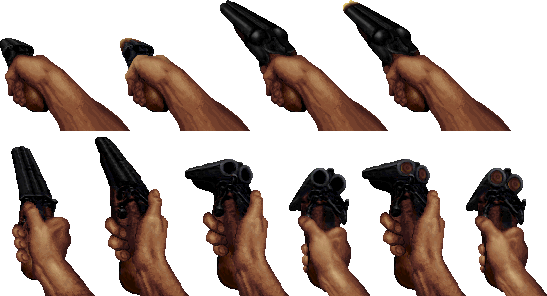 The pump action isn't, but hopefully you won't regret the choice of weapons; i did a very simple list that covers Blood 1&2 arsenal, just to be sure. Of course, there'll be the ones who prefer to use this instead of that, but you know, you can't please everybody. That's cool! I hope at the very least, the pump-action will be included in the future as an optional addon weapon. Kinda like what you did with that one mod of yours. Lowtech I believe it was called? Really awesome mod you made! And I'm sure it's silly of me to request it, I just thought it was worth a shot to ask about it. Last edited by Dzierzan on Sun May 06, 2018 10:19 am, edited 2 times in total. Hey, i see you've worked a little bit more the edit that i created for Ultra Crispy. Feel free to use it, but don't forget to give credit. Over some months, I've done some bigger or lesser edits. That's great, good to see you're still working on Blood-related stuff! 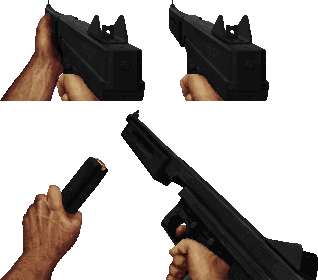 Alpha akimbo sawed-off sprites recolored by Dude27th, I just changed the hand so it looks better imo.